When John Sonsini began painting Latino day laborers in Los Angeles, California, around 2001, his intentions weren't quite political. They were practical. The subjects were available and abundant. Sonsini first noticed a man cleaning up outside the building that housed his studio. They struck up a conversation. Sonsini, upon learning that the man spent his days looking for work on Olympic Boulevard, offered him a job: artistic subject. The 'concept' is really all wrapped up in the need to find guys who would be available to model daily at the studio," Sonsini explained to The Huffington Post. "It was my partner Gabriel’s idea to approach the guys gathering for work in the neighborhood of our studio. So the notion of painting dayworkers grew entirely out of my need to have sitters who were available to work daily in the studio." Sonsini, born in 1950 in Rome, New York, previously compared his painting practice to street photography, emphasizing its spontaneity and intense interest in quotidian detail. 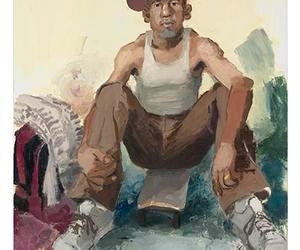 He's previously painted individuals he met on the street in L.A., and spent over six years painting no one but his partner Gabriel. Sonsini also recognizes similarities between his painting practice and the craft-based tasks his subjects are often hired to complete, as both manually create an object from nothing. For Sonsini, the painting process can take weeks to complete. "I try to select someone I think can stick with the job until the painting's completed," he said. "Its quite a commitment to return every day like that. Usually it takes a kind of relaxed personality, who won’t get bored with the sameness of each day." Sonsini pays his sitters their normal hourly working wages for their time. The subjects assume everyday poses in their everyday clothes. Some stand awkwardly with their arms crossed, as if awaiting further instructions, while others sit casually, hunched over, legs spread. The resulting images diverge starkly from the traditional art historical sitter's pristine posture and carefully selected -- often symbolic or ostentatious -- garb. The images, despite their painterly rendering, where brush strokes are celebrated instead of silenced, feel raw and immediate. Making eye contact with Sonsini's subjects feels like locking eyes with a stranger while crossing the street, momentarily wondering what life is like in their shoes. The paintings capture the humanity of Sonsini's subjects without political agenda or an uplifting message. Rather, we see the way people take up space, the minute details of their facial expressions, the vague sensation of their presence. The expressive portraits may never completely break from a political interpretation, but it's clear that Sonsini is compesnating for the art world's lack of diverse faces almost haphazardly. Painting from life, the process is really so totally absorbing that I don’t really think about trying to say something about the sitter," Sonsini said when asked about the message behind his work. "Sometimes I try to recreate a facial expression, or bodily gesture, but I try to steer away from trying to convey anything personal or biographical about the sitter. I like all that to be very open, far preferring the viewer to make of it what they will." Sonsini's current exhibition at Ameringer | McEnery | Yohe gallery also features paintings of still objects -- luggage, cowboy hats, sneakers, changes of clothes. Like his portraits, the still lifes attract potential narratives and symbolic undertones almost immediately. But potential readings and meanings eventually give way to the corporeal power of the images themselves, the humble beauty of a worn suitcase slumped over as if with exhaustion. 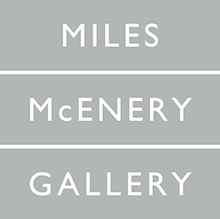 Sonsini's work is on view at Ameringer | McEnery | Yohe from February 11 until March 12, 2016.